I've just been fitting a Malossi kit to my Suzuki AN400 Megascoot. The first stage is to remove the lower left body panel. This has an astonishing number of little plastic nubbins that hold it on. The foot rest rubbers also have a very large number of bits that plug into the bodywork and you have to get under them to reach some of the fixings. Eventually you get the bodywork off, and the next piece is the CVT air filter cover, and then the plastic CVT cover. That gets you to here. The next piece to remove is the inner cover. This is ally and has two dowels that eventually get stuck, bottom right and top left. 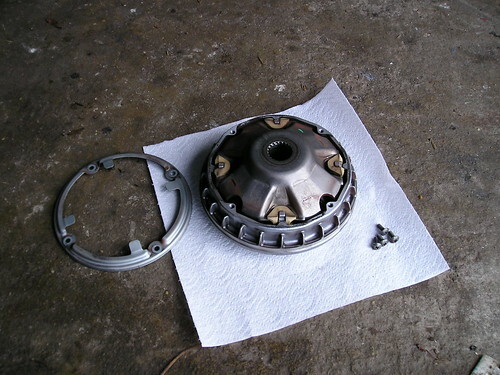 The cover has an outrigger bearing for the clutch mechanism. Sometimes the shaft spins in the bearing making a nasty screech at very low speeds. You can safely ignore this as I'm not sure how to fix it if it happens to your bike. With the ally cover taken off, we have this. The belt and two pulleys are now visible. We need to get the nuts undone on the front and rear pulley and remove them. I used a Halfords 12V hammer socket driver. Piece of cake. Way easier than cobbling together crowbars and using old bits of belt to try and lock the front socket. The nuts are 24mm so you may need to get a 24mm socket. The front pulley assembly now comes off. There's a bent spring washer behind both nuts. Make sure you keep everything the same way round so the spring washer goes back on the same way. You need to remove the oil splash plate to get the centre slider out as we need this for the Malossi kit. The centre slider has 4 plastic locator pieces which we also need. Assemble the Malossi replacement with it's 8 rollers, slide the centre bearing shaft into the middle, put the centre slider piece in o top of the rollers and mount it back on the shaft. You need to hold whole thing together with your fingers round the back as you slide it on the shaft to stop the rollers falling out. Put the outside pulley on and the washer and nut. Just finger tight as we'll be removing it again. Now the scary bit which is changing the spring in the rear driven pulley. 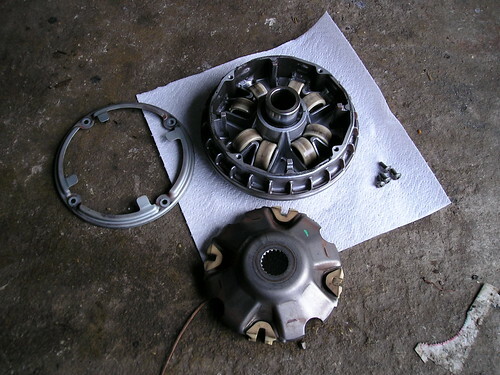 Remove the clutch drum and then the whole clutch pulley assembly. The problem is that we need to undo that big nut, but it's holding spring pressure behind it and there's no easy way to hold the whole assembly still while you undo it. Of course there's various factory tools to do this which cost large amounts of money and nobody has them. So here's the trick. Put the assembly in a vice with a cloth or bits of wood and tighten it down, being careful not to damage the fins on the back by resting the vice jaw against lots of them. Then use a large C-clamp to take up the tension on the other side. If there isn't one already, put a mark on the nut and centre with a felt tip. Now you can use a big stilson wrench to undo the nut. Undo it until it's almost off. Now release the vice pressure leaving the C Clamp holding everything together, pick what's left up and put it on the floor supported on a couple of blocks of wood. Now with your foot holding the top down, remove the big nut, release the C Clamp and gently let the spring expand. If your vice is big enough, you could probably do all this in the vice rather than on the floor. There's quite a bit of preload but once the spring is an inch or so free, you can hold it down with your hand and gently release it. 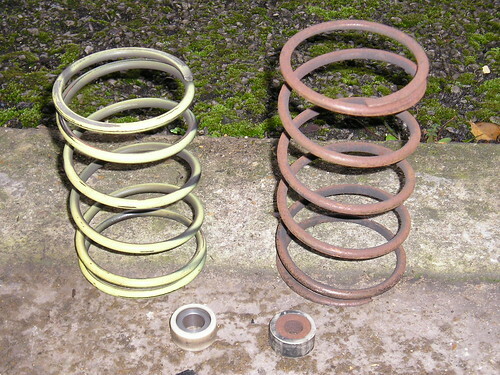 The spring and roller on the right came from an AN400X (MkI). The spring and roller on the left are from the AN400K3. It looks like Suzuki now use less preload and an 18gm roller instead of the original 21gm. More on this later. 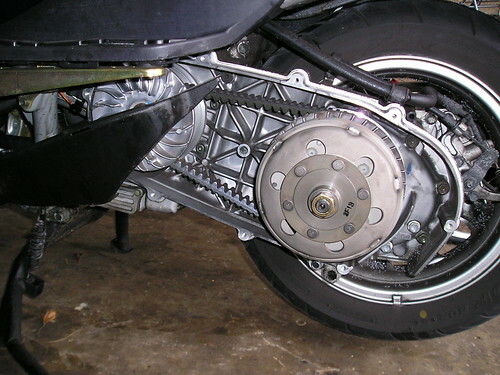 The Malossi spring is lighter but about the same height as the stock AN400K3 spring. So fit the spring, hold the clutch part down with your hand or foot and finger tighten the big nut in the middle. Now take the whole assembly back to the vice, put on the C Clamp and tighten the nut down with your stilson. The official torque is 105 Nm which basically means as tight as you can get it. A tip here is to get your felt tip marks to line up again so the nut is in the same place and will probably have the same torque as when you started. Now put the whole assembly back on the rear shaft with the belt in the pulleys, Put the clutch drum back on and then put the spring washer back on the same way round. 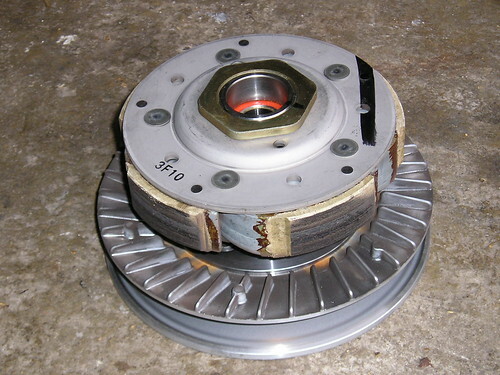 This is with the outside edges against the clutch and inside edges against the nut. Now do up the nut with the electric hammer socket. The torque setting is 85Nm so you can try a proper torque wrench and something rigged up using the holes to hold it still. Easier is just to give it a few goes with the hammer driver. I put a drop of loctite on the nut threads as well. When everything is done up tight with the belt in place, use a bit of wood and your hands to lever the pulleys apart which lets the belt drop into the centre. 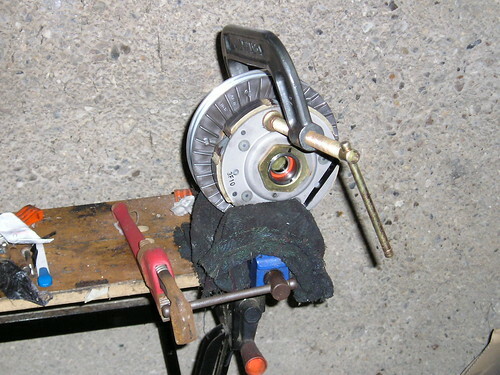 Now take off the front outer pulley, put the belt around the shaft and replace the outer pulley, spring washer and nut. The washer goes the same way round as the other one. You need to make sure the belt is free and not being pinched by the pulley as you finger tighten the nut. The torque on this nut is 105Nm. Holding the pulley still is not easy. Don't be tempted to wedge a large screw driver in the fins as you'll just break a fin off. You can feed an old bit of belt between the pulley and casing to wedge it solid but easiest is just to give it a few goes with the hammer driver. Again a drop of loctite on the threads is good for peace of mind. Now check over everything, replace the inner and outer cover, and the air filter and air filter cover. This is a good moment to clean the air filter. Suzuki now use yellow foam so it's easy to see the muck. Finally re-assemble the lower left panel putting all the plastic nubbins and screws back in. Done! Now I've only had a quick run up the road, but you'll find that under hard acceleration the revs have risen in the mid range from 5.5K-6K to 6.5K-7K the engine is pulling a bit harder and the gear ratio has dropped. And the end result is quite a bit more acceleration between 25 and 60. Now some alternatives. The Malossi kit is not exactly expensive at about Â£120 so that's the easiest way to go. If you fancy an alternative, the stock AN400K3 rollers seem to be 18gm where the old AN400X were 21gm. The Malossi set are 16gm with a lighter spring. So it seems highly likely that you can get almost the same effect by using the stock spring with 17gm rollers. Malossi don't make 17gm but Taffspeed apparently do have 17gm rollers from another manufacturer. As an alternative you could use 4 Malossi 16gm with 4 stock 18gm (spaced symmetrically) to give an average of 17gm. Rollers are cheap. But unfortunately I've now gone for the full Malossi so somebody else will have to try this. 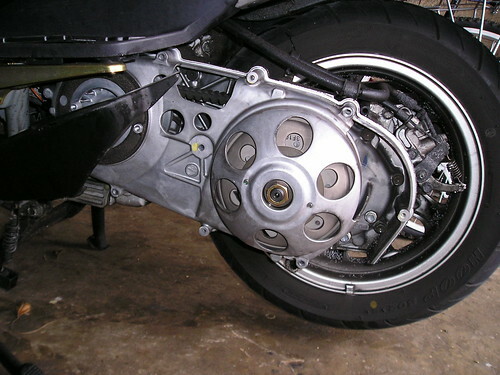 I think what's happened is that Suzuki have made the CVT a bit more lively and also reduced the spring pressure, but they haven't gone as far as Malossi do. This ties in with some drag race testing that Paul Blezard and I did between a new AN400K3 and my old AN400X-Malossi. The X was consistently faster up to about 45mph no matter who was riding. But the K3 then pulled back and started to catch up. One guess here is that the Injection model is inherently quiter and more efficient and so Suzuki didn't have to try quite as hard to put a hole in performance to get past the noise tests.